Really, really, wicked problems. That’s how social problems without easy solutions are described. They are not your parents’ problems, as difficult as some of those may have been. No. These are 21st Century social problems so complex, contradictory, or just wholly resistant to change that few bother to tackle them. Those brave, or, perhaps, foolhardy enough to take them on often end up being washed overboard from the ship of reason into an angry sea of entrenched opinion. Ask Al Gore. And even the ones who navigate all the risk and do manage to solve some part of the problem find they inadvertently made things worse because they failed to see all the interdependencies at play. In other words, untangling a problem knot on one end of the string tightens different ones in two other places. The environment is one such problem. Survey after survey in Canada and the United States reveal that the majority understand the threat of global warming, but it is difficult to change people’s behaviour when their livelihood depends on maintaining the status quo. Add a liberal (irony alert) dose of misinformation to the problem frame and any possible solutions to a changing environment just got a whole lot more difficult to resolve. Just what are the qualities of a wicked problem? Forget politicians and bureaucrats. Want to tackle a wicked problem? Bring on designers and artists. If you can’t imagine a world run by creative people at least give them a place at the decision-making table. You never know how they’ll respond to the task. That’s why MESH Cities can take on the challenge of growing cities without tackling wicked problems—at least not in a way that solves one snag but raises two others in its place. MESH Cities manage this Herculean task by combining crowd sourcing methods (and crowds naturally include those often unsettling designers and artists) with a little secret computer scientists call failing faster. MESH Cities then unite these synergistic processes with a side dish of big data. Here is the thing: digital technologies are assembling an almost infinite amount of information. That information set includes working solutions to problems others consider wicked. Understanding and/or reframing this available data gives problem solvers access to a big box store of tools that can be applied to any wicked problem. Maybe those problems are not wicked after all. Maybe they are just drawn that way. 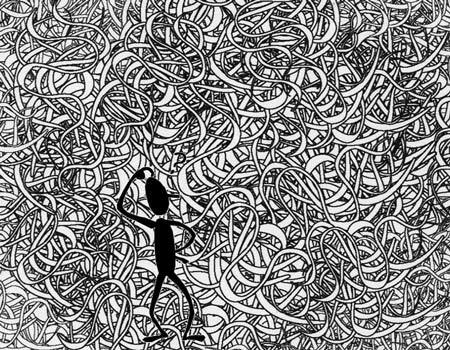 I am being simplistic; however, needless complexity can often make simple problems seem wicked and do we really need that? Do you have a way to solve really wicked problems? If so, share it with our readers. They would love to find out more.